WASHINGTON — Should the Supreme Court make it all stop? At the base level, that’s the question that the nation’s highest court grappled with Wednesday, as Albert Snyder, the father of a dead Marine, squared off with one of the most notorious fringe religious groups in the U.S. 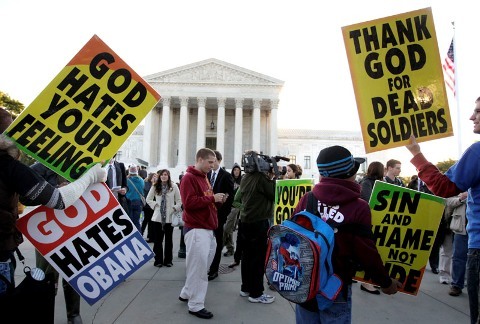 The details are well known: The Westboro Baptist Church, of Topeka, Kan., protested outside the 2006 funeral of Lance Cpl. Matthew Snyder in Westminster, Md., after he died in Iraq in a Humvee accident. They followed Maryland law, standing 1,000 feet away from the Catholic church where it was held. However, they infuriated hundreds of funeral goers with signs bearing messages that included “Thank God For Dead Soldiers,” “You’re Going to Hell” and “Thank God for IEDs,” a reference to the improvised explosive devices that have killed thousands of U.S. troops in Iraq and Afghanistan. It’s one of hundreds of military funerals the church, led by patriarch Fred Phelps, has protested under the pretense that God despises the U.S. because it tolerates homosexuality. Snyder sued the church for emotional distress and was initially awarded $11 million in damages, but the entire judgement was eventually overturned on appeal. Snyder and his legal team appealed to the Supreme Court, and in a surprise, the court agreed in March to hear their case. I was one of nearly 100 journalists who attended the oral arguments this morning in U.S. Supreme Court for the case, Snyder v. Phelps, following up on a spring cover story I wrote for Marine Corps Times after the court agreed to hear the case. For a first-timer in the highest court in the land, it was a surreal experience, especially considering the emotional electricity enveloping the case. I arrived at the court at about 8:30 a.m., heeding a warning I received the day before from court’s public affairs office. It’s a good thing, too: The exterior of the building was mobbed with media, Westboro protesters, anti-Westboro counter-protesters and tourists in line hoping to catch a glimpse of the proceedings inside the courtroom. 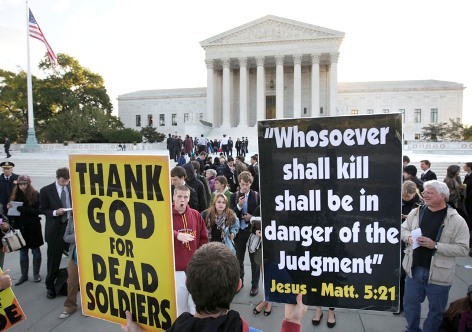 The Westboro protesters’ signs outside the court fell along the same lines as those displayed at the funeral of Snyder and hundreds of other U.S. service members, but also included other messages, including “Thank God for Breast Cancer.” They preached at the top of their lungs to anyone within earshot, and sang twisted versions of songs ranging from Ozzy Osbourne’s “Crazy Train” (The chorus: “You’re going straight to hell on your crazy train”) to Irv Berlin’s “God Bless America” (Big shocker: They went with “God hates America”). Counter-protesters demonstrated with signs expressing patriotism and support for the Snyder family, and with messages supporting gay rights. One man, dressed in sneakers, underwear and white sunglasses, carried a sign saying “Fred Phelps wishes he were hot like me.” It was that kind of day. By 9:20 a.m., was inside the court’s press office with about 100 of my closest friends. The media crush was significantly larger than for a “normal” Supreme Court case, several full-time Supreme Court reporters said. Regulars were allowed to sit within the courtroom itself, with about 65 additional journalists and I sitting in a foyer adjacent to the court, allowing us to catch glimpses of the justices between lush red curtains hung in the court. In addition to mainstream media, there were journalists present from publications covering the military, gay rights, law and Christianity. From my tiny wooden chair, I could see the justices farthest to the right — Ruth Bader Ginsberg, Samuel Alito and Elena Kagan — and the lawyers arguing the case. We could hear virtually everything. Analysts and journalists appear to be in disagreement over how the proceedings in court played out. While everyone in court saw many of the justices express sympathy to Snyder, they raised questions that put both sides on the spot in the course of the hour-long session. McClatchy News Service reported that “more than one close court observer” said Margie Phelps, a Westboro church member representing it in court, “out-performed” attorney Sean Summers, who argued on behalf of Snyder. On the other hand, an analysis piece for The Atlantic suggests that while Snyder faced long odds in getting the court to side with him, they were improved Wednesday by Margie Phelps’ performance as a lawyer. The wise thing would have been for her to concede that Snyder was a private figure and focus on the First Amendment and the broad rights to free speech that it offers, the piece says. Instead, she repeatedly insisted on saying that since Snyder responded to a reporter’s questions, he was fair game for Westboro protests. My own take, for what it’s worth: Summers looked overwhelmed at times, but earnestly tried to answer the justices’ questions. They tripped him up a bit when they asked him what constituted a private funeral and how the Phelpses could have invaded Snyder’s privacy if he never saw the protest signs and they stayed 1,000 feet away from the church, as required by Maryland law. Phelps had her struggles too, though. Some of the justices seemed skeptical when she said the church’s signs didn’t include “fighting words,” which are not covered under the First Amendment, and observers scratched their heads when she insisted that Snyder injected himself into the public sphere — and into the sights of the Westboro church — by talking about his son’s death with a local newspaper reporter. What all that means is anybody’s guess, however — a point that Summers acknowledged after the hearing before a throng of reporters. With a decision not expected to be announced until next spring, it’s going to be a long winter for a lot of people. If you want to see what sort of nutjob Fred Phelps really is, check out the wikipedia page on him. I saw a guy that was at the supreme court with a Marine Corps flag the day of the Supreme Court hearing. He was walking back and forth for three hour from what I read, the whole time waving the Marine Corps flag. Are you guys going to cover that? It’s everywhere on the net it seems but where it should be, where most Marines will, and should, see it. And I will lay my vengeance upon them, and they shall doe according to mine anger, and according to my furie, and they shall know my vengeance, saith the Lord God. GOD says Vengeance is mine saith the LORD. Prepare for your day of Judgement Westboro. BRANDON, MS: read how this small suberb of JACKSON, MS ran them out with a wimper. Not one member attended the funeral. Most were blocked in their parking spots for a few hours, the tow trucks were backed up, and the members who did manage to make it to the funeral had to be taken in for questioning about their possible involvement in a crime. It took about two hours before police knew it was not them. One man arrived a few days early. He was shooting off his mouth in a convenience store and some people beat him half to death. It was really sad that not one person questioned had seen anything. Do you want to come back to MS again? lol we are the Hospitality State. Ironic how well African Americans and Caucasions work so well together down there. We just do not like you. Come on back, ya hear.